There are many beautiful cars in the world today. Mostly everyone has a dream car that they desire, especially car enthusiasts. When talking about car safety, most people think of airbags and crash test ratings. However, there’s another danger to keep in mind: toxins. 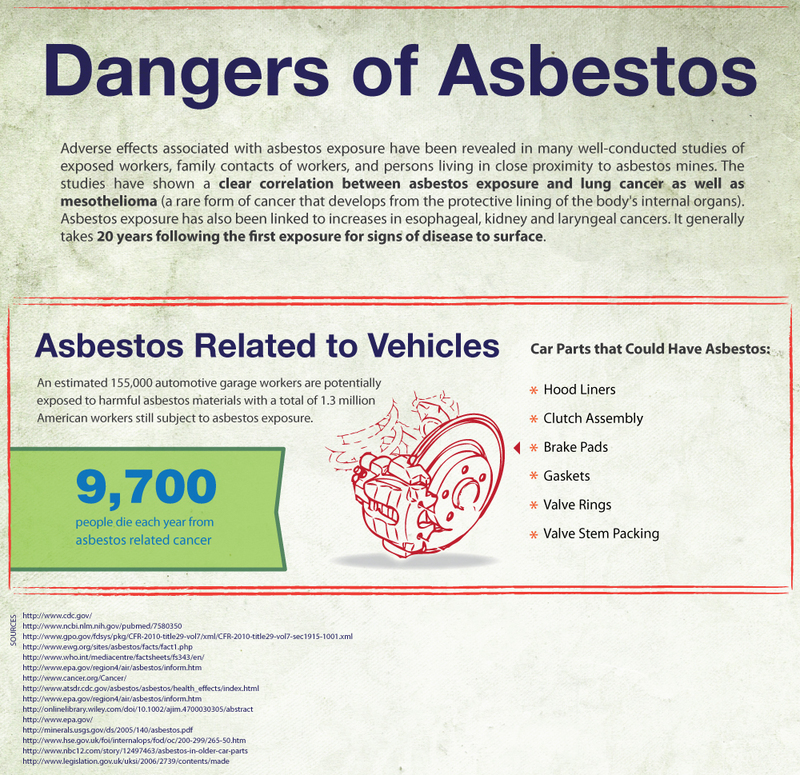 One of the most notorious substances is asbestos, but cars also contain harmful PBDEs and phthalates. For decades, cars have been built with asbestos-containing brake linings and pads, clutch facings, gaskets, and hoodliners. Millions of these cars are still on the roads today; this means that auto mechanics are at a high risk of asbestos exposure. Anytime a part with asbestos is disturbed, microscopic asbestos fibers are released into the air. Breathing this in can cause health conditions such as asbestosis, lung cancer, and pleural mesothelioma, which is a particularly aggressive and painful type of cancer. What makes asbestos especially insidious is that symptoms may not develop for 15 to 50 years after initial exposure. By the time someone realizes that he has been exposed, it’s often too late. Even worse, many people mistakenly believe that asbestos has been banned and is no longer in use; they do not realize that exposure is even possible. These are often used as fire retardants both in the vehicle cabin and in the car’s interior. Passengers are potentially exposed to PBDEs from seat cushions, armrests, and floor coverings when the car interior becomes hot enough and when UV rays from the sun enhance chemical breakdown. Exposure typically occurs through inhalation and physical contact with dust. Laboratory studies on animals has linked PBDE exposure to thyroid dysfunction and liver toxicity. These chemicals are mostly used to soften PVC plastics and are partly responsible for the “new car smell.” As with PBDEs, inhalation and contact with dust are the primary means of exposure. Animal studies indicate that one type of commonly used phthalate, DEHP, is linked to reproductive problems, premature birth, and early puberty. Given that the average American spends over 1.5 hours in a car each day, not to mention auto mechanics who spend eight or more hours a day buried in a car’s interior, having toxic materials floating around is a real danger. Several associations and legislations are urging auto manufacturers to phase out these chemicals from production, but it’s a slow process. Clearing older cars from the roads will take even longer. So what can people do right now to minimize their risk? Whenever possible, ventilate car interiors, use solar reflectors, and park away from sunlight.